Lucia di Lammermoor :: TicketServices.gr " // + "
*At the performance on March 10th, the role of Edgardo will be performed by Shalva Mukeria. Donizetti's bel canto masterpiece is the first co-production of the Greek National Opera with the Royal Opera House, sponsored by the Stavros Niarchos Foundation. The production directed by the renowned British director Katie Mitchell received highly successful premieres in London in 2016 and in Athens in 2018. Mitchell chose to probe into the 19th century woman's world and see the story through the eyes of the central female character. As a contrasting foil to the dark, male-dominated world of the North -as conceived by Sir Walter Scott-, Mitchell brings woman's viewpoint to the foreground and sets the entire work within the context of that era's literature, in an atmosphere, like the one prevailing in the works of the Bront? sisters. 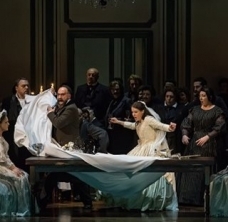 In Lucia, the stage is separated in two parts, as Mitchell suggests two parallel narratives: on the one side the audience watches all that is described in the opera's libretto and on the other side light is shed on the events that take place in parallel, events which fill in the blanks of the narrative and reveal the work's feminine aspect. The wonderful sets and costumes, distinguished by their high aesthetic quality and rare detail, were designed by the exceptional British set designer Vicki Mortimer. After eight highly successful sold out performances at the Stavros Niarchos Hall, the Greek National Opera remounts the work in February and March 2019.